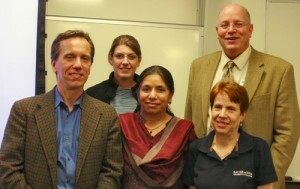 Microfinance is a tool used to help those in poverty develop sustainable businesses, said Anthony Pace, executive director of The PLAN Fund, left, at a recent UH Bauer College event attended by MBA candidate Elizabeth Vallette, Associate Professor Saleha Khumawala, MBA Academic Advisor Marian Newman, and Assistant Dean Frank Kelley. With guidance from a professor, several students at the University of Houston C. T. Bauer College of Business are embarking on a project that aims to significantly reduce poverty in Houston. Dr. Saleha Khumawala, an associate professor of accountancy and taxation, is teaching a course in the principles of microfinance, the term for providing small loans, often $100 or less, to people in extreme poverty, allowing them to grow their small businesses. “This course provides a unique opportunity to learn about microfinance and wealth creation, as an important development effort in the war against poverty,” she said. Students in the course will be working on a project alongside the Alliance for Multicultural Community Services, a non-profit organization that provides services to refugees, immigrants and low-income residents of Harris County to give them the chance to become self-sufficient. “The students will be serving the financially displaced people here in Houston by meeting with them, evaluating their portfolios and business plans and then making decisions on giving microloans,” Khumawala said. Khumawala hosted a speaker in February at UH Bauer College to emphasize the importance of business loans and the differences between lending abroad and domestically. Anthony Pace, executive director of The PLAN Fund, a group that assists entrepreneurs in developing sustainable businesses, said microfinance is the key to energizing a local economy. Domestically, monetary lending is based on credit scores, Pace said. The higher a credit score, the more likely a person is able to obtain a loan. Internationally, an applicant’s credit history is likely to be reflected in an individual’s friends and neighbors, he added. For more information in The PLAN Fund, a non-profit organization based in Dallas, visit their website. For information on the UH Bauer microfinance course, contact Khumawala.